Liked the Possum Magic and Olympic $2 coins? You'll love this set from the RAM. We are pleased to announce that the limited edition 2015 $1 WWI War Heroes Colour Coin featuring the red poppy motif is now available to order from Downies! This official Australian legal tender coin was originally part of a promotion that saw fourteen 20 cent coins made available to the general public through newsagents over a two week period. The colour $1 coin was initially released exclusively to News Corp subscribers, and we were therefore surprised to learn that we would be soon receiving an allocation of the coin from the Royal Australian Mint. Thus, we are now able to pre-offer this exclusive $1 coin to the broader Australian collecting public. This spectacular $1 coin features a poppy field design with a large central poppy motif rendered in an eye-catching red hue. At the top is the inscription ‘WWI – War Heroes’, while at the bottom is the coin denomination of ‘1 Dollar’. On the obverse side is the effigy of Her Majesty Queen Elizabeth II, designed by Ian Rank-Broadley. Like regular one dollar coins struck by the Royal Australian Mint, the War Heroes coin is made from Aluminium-Bronze and measures 25mm in diameter. Unlike other dollar coins however, this colour release has been struck with a ‘frosted’ appearance, and only 13,500 coins have been minted for distribution worldwide. Whilst we have received confirmation of our allocation from the Royal Australian Mint, the nature of the News Corp promotion means that a fixed date for delivery of the coins from the RAM has not been confirmed at this stage. We are expecting, however, that delivery from the RAM will take place by early June. We will be sending an email notification to those who order this coin as soon as we receive a firm delivery date. The design for the new 2015 Lest We Forget colour $2 circulation coin has been revealed today at a special ANZAC Commemoration Ceremony held in Melbourne. The event was held at the Malvern Cricket Ground in Melbourne's inner east, hosted by the Honorable Kelly O'Dwyer MP (Federal Member for Higgins & Parliamentary Secretary to the Treasurer) and Cr Melina Sehr, Mayor of City of Stonnington and featuring a number of other dignitaries. Hundreds of people braved the temperamental Melbourne Autumn weather to attend the ceremony which stared with a march from Malvern Gardens, up High St and finished at the Malvern Cricket Ground. Around the grounds were tents for various local entities such as schools and businesses, as well as Kelly O'Dwyer's mobile office which had on display one of the $2 colour commemorative coins due to enter circulation from tomorrow. The coin features red stripes in a circular pattern in the middle, framing the words "Lest We Forget", with a design around the coin consisting of 5 crosses among a ring of poppies. In the bottom portion is the coin denomination of Two Dollars. Unlike previous colour $2 coins issued into circulation, the 2015 Lest We Forget $2 coin will not be available to buy in Uncirculated condition through the Royal Australian Mint. Approximately 1.5 million coins will begin to be released into circulation by the Reserve Bank of Australia as of tomorrow, Monday April 20th, although it may take several days or even weeks for them to be fully released. However much like previous colour $2 issues, there is little doubt that due to the poignant nature of the commemoration and sheer difference in design of these coins from the regular $2, people will hoard them away instead of spending them, making them quite hard to find in a short space of time. The same has happened with the 2014 $2 Remembrance Day Green Colour Coin, the 2013 $2 Coronation Purple Colour Coin and the 2012 $2 Poppy Red Colour Coin. The latter being distributed through the national RSL Red Poppy Appeal rather than through the Reserve Bank of Australia. Canada is the only other country to have released colour coinage into circulation - and this is only the 4th Australian circulating coin to be issued in colour - making this a significant commemoration of the ANZAC Centenary as we approach the 100th anniversary of the battle at Gallipoli. 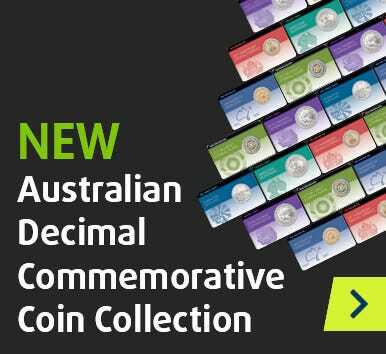 So keep your eye on your small change over the coming days and weeks and if you find one of these colour commemorative $2 coins be sure to post a picture below or on our Facebook Page. It has been announced that a newly designed $2 coin will be issued into circulation as of Monday, April 20, 2015. The surprise announcement was made on the 3AW radio station yesterday, when Parliamentary Secretary to the Treasurer Kelly O'Dwyer was discussing the events to be held at Malvern Gardens as part of the 100th anniversary of Gallipoli commemorations. Struck by the Royal Australian Mint, the coin will be unveiled at the Anzac Centenary March that kicks off at 11am on Sunday, April 19, 2015 at Malvern Gardens on the corner of High St & Park St, Malvern, Victoria. This will be only the 4th coloured $2 coin issued in Australia, starting with the Red Poppy Remembrance Day $2 coin in 2012. In 2013 there was a Purple $2 issued to commemorate the 60th anniversary of the coronation of Queen Elizabeth II, and in 2014, a Green $2 was released into circulation to honour Remembrance Day. Collectors and the general public alike have delighted in finding and hoarding away these coloured coins over the last few years, and you would now be very lucky to find any of them in your change. The new 2015-dated Red Poppy $2 will undoubtedly be no different. "It's an incredible design." Mrs O'Dwyer said. Going on to describe the coin as "Poppy red" with a design consisting of crosses and poppies. The Australian Government currency determination website describes the design of the coin as having the inscription 'LEST WE FORGET', with a series of red coloured stripes arranged in a repetitive circular pattern surrounding the central circle. The coin will also carry a representation of poppy flowers between 5 stylised representations of crosses, along with the coin denomination of TWO DOLLARS. So, be sure to keep your eye out for this special new colour $2, and let us know when you find one! To honour Australia’s fallen and their families, the Royal Australian Mint has issued the first colour coin struck for circulation in Australia. The coin features a colour poppy on the reverse, the accepted symbol of Remembrance Day and so used for the poppies that were the first plant to grow on the devastated battlefields of northern France and Belgium. This haunting image was so powerfully captured by Lieutenant Colonel John McCrae in his poem In Flanders Fields, that it became the symbol of the blood shed by soldiers who have died in battle and is recognised around the world. This coin is an historic tribute to those men and women who fell defending this country and its allies. It is also a poignant reminder of the role that Australia’s Armed Forces continue to play and is a fitting Remembrance Day commemoration. Your chance to be involved in a significant part of Australia’s history … Twice. This release has deep significance for all those who remember Australia’s fallen service men and women, or who have a connection to those who served. Not only does it have a strong historical significance, but this release also has deep numismatic importance. The Royal Australian Mint has released three versions of the coin, each slightly different but ground-breaking. The non-colour commemorative release is, along-side its coloured counterpart, the first commemorative $2 ever to be issued into circulation. The colour version of the circulation release is significant in two ways; it’s the first colour coin to ever be struck for circulation in Australia, and it has an unusual release channel. This version of the coin will be available at RSLs around the country in exchange for a donation, starting Remembrance Day. The third type is a full colour, uncirculated commemorative coin with a unique ‘C’ mintmark, and is available now, here. Not only is this coin struck using the RAM’s state-of-the-art full-colour minting process, but it is presented in an official Mint display pack. It has already proven to be extremely popular among collectors for its numismatic and historic significance and is sure to be a valued collector’s item for years to come. This is a coin that holds a deep and special significance for all Australians. So whether you buy the specially packaged commemorative edition of the coin, donate to your local RSL or find one of the circulating coins in your change, be sure to take a moment to admire this piece of Australian and numismatic history, and remember the fallen. Visit your local RSL on Remembrance Day this November 11th, or head to Downies.com to secure your piece of Australian history. According to tradition, St George (c256/285AD-303AD) was a Roman soldier from the eastern part of the Empire, who served under the Emperor Diocletian (284-305AD). Venerated as a Christian martyr, many fanciful stories about his deeds emerged over the centuries, including the most famous of all legends – the tale of St George & the Dragon. Originating in the east, and brought back to Western Europe by the Crusaders, the story of St George & the Dragon revolves around a village threatened by a plague-bearing dragon. Originally appeasing the evil beast with a steady supply of sheep, the townsfolk were then forced to select their own children by lottery to sacrifice to the Dragon. Ultimately, the King’s own daughter was chosen, and, following the townsfolk’s refusal of his wealth and property in return for her safety, the Princess was sent to the lake where the Dragon lived. Whilst she awaited her gruesome fate, St George appeared. Refusing the Princess’ plea to escape, St George waited for the dragon, and when it emerged from the lake, he fortified himself with the Sign of the Cross, charged at his foe and dealt the dragon a grievous blow with his lance. According to legend, St George and the Princess led the wounded Dragon back to the town. Upon receiving a promise from the townspeople to convert to Christianity, St George killed the Dragon, with a church built on the spot where the lethal strike was delivered. Enshrined in art, literature and, of course, coinage, for approximately the last 1,000 years, the tale of St George & the Dragon, whilst varying slightly across cultures, is undoubtedly one of the world’s most celebrated folkloric tales. Today, Patronages of St George exist in many nations and cities around the world, including England, where the Cross of St George forms part of the national flag. Majestic, Exclusive & Stunningly Rare! An extremely exclusive tribute to a renowned Australian species, the second release in the sold out ‘Extinct and Endangered’ series pays tribute to one of the most distinctive birds of prey – the Tasmanian Wedge-Tailed Eagle. Spectacularly powerful, forcefully independent and the ruler of the sky, the Tasmanian Wedge-Tailed Eagle is one of the most extraordinary creatures found within open plains, forests and mountains of Tasmania. Classified as endangered by both the Commonwealth and Tasmanian Governments, the Tasmanian Wedge-Tailed Eagle faces the brutal realities of extinction. With an estimated population of 1,500 with only 130 pairs capable of breeding, fierce efforts are being put into place to maintain this majestic creature in our skies. Struck to Proof quality from .999 fine silver, the full-colour obverse portrays this remarkable animal surrounded by the rustic terrain of the Tasmanian Highlands. Superbly crafted from The Perth Mint’s highest minting standards, this 40mm Proof is housed within a glossy ‘birds-eye’ wood grain presentation case and accompanying numbered Certificate of Authenticity. A truly spectacular second release, this official Australian legal tender coin is restricted to a tiny mintage of just 5,000. Available for purchase online, head on over to Downies.com!